Salt Lake City, UT – The late afternoon sun is sinking below the ridge line as you and your buddy return to your car at the end of a full day of backcountry skiing. You’ve been on the mountain since your dawn patrol departure after poring over topo maps under the glow of your car’s map light. You’ve had a powder-filled day that’s left you smiling from ear to ear, but now you’re exhausted and cold as the temperature is quickly dropping while the sun sets. You step out of your skis, put the key in the ignition and turn. Click click. Click click. Click. You left the car’s map light on all day. It’s battery is now dead, and you’re 12 miles up a dead-end road at a remote trailhead, outside of cell service with no one else in sight. But unlike your friend, you don’t panic. Instead, you quietly open up the glove box and retrieve your Weego, a tiny new jump starter that fits in the palm of your hand. You plug in the alligator clips that connect to your car’s battery, turn the device on, and get back inside your car to turn that key again. Minutes later, you and your buddy are heading home in a warm car. We tested Weego’s JS12 Heavy Duty 12,000 mAh version ($129.99), designed for gasoline engines up to 6.4 liters or diesel engines up to 3.2 liters — enough to jump start a hemi and power a laptop. This is no giant lead acid battery jump starter that goes in your trunk. Instead, this pocket sized device utilizes the latest Lithium-Ion battery technology that can hold a charge for up to six to 12 months as it drains only two percent per month when stored, and five blue LED indicators confirm the Weego’s charge level at the press of a button. 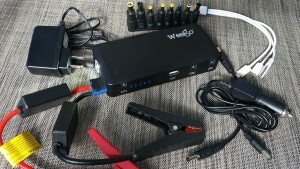 The Weego has a built-in LED flashlight to find your car’s battery in the dark, 12V and 19V outputs to power a laptop (with charger tips supplied in the box), and a 5V/2.0A USB output to recharge mobile devices with the included multi-device cable that has a microUSB tip for modern Android phones and tablets, and Apple 30-pin and Lightning tips for iPhones, iPods and iPads. 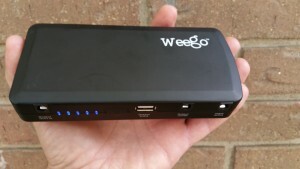 The Weego may be charged from an AC wall socket or on the go with the included cigarette lighter adapter. A handy, amply sized drawstring bag is included to keep everything together. About the only thing missing that we would’ve liked to have seen is a built-in solar panel to maintain a trickle charge to keep it topped off. Despite being initially skeptical about jump starting a vehicle with a device this small, we walked away impressed. We hooked the Weego to a dead battery in a 4.0-liter V6 Toyota Tacoma and started the truck on the first try. At a full two amps of output, the USB port charged our smartphones quickly. And at 12,000 mAh, the battery is sufficiently large to recharge our full-size Windows laptop three times. The manufacturer claims an ideal operating temperature range of -4ºF to 140ºF so it’s OK to leave in a cold car, although in extreme cold we’d recommend pre-warming the device in an inside pocket before jump starting. The Weego comes in two other flavors, the JS6 Standard ($99.99) which is rated at 6,000 mAh for gas engines up to 4.6 liters or diesels up to 2.4 liters, and the JS18 Professional ($189.99), which packs a powerful 18,000 mAh for the largest 6.4-liter gasoline and 4.8-liter diesel engines. All come with an 18-month warranty and are said to handle up to 1,000 charging cycles. With a jump starter so small that it fits in your center console or glove box, there’s no reason to get stuck after skiing with a dead battery again.